How journalists failed in 2016—and what we must do to cover President Trump. We cannot make the same mistakes in covering the Trump presidency. A journalist records a video as Donald Trump speaks during the first presidential debate with Hillary Clinton on Sept. 26. Donald Trump’s catastrophic victory on Tuesday night poses the single greatest threat in generations to what we Americans quaintly call our way of life. Trump’s maniacal self-centeredness, his attraction to authoritarianism, and his blatant contempt for the truth combine to form a standing reproach to everything decent about American politics and culture. The more liberal version of American exceptionalism has always rested on the belief that although the United States may not protect its most vulnerable citizens the way that many European countries do, it is at least insulated from the type of xenophobic populism which has plagued—and plagues—that continent. But those of us who assumed, before the presidential primaries, that our institutions would surely spare us from frothing rage and bigotry were proven to be dangerously naïve. We have now lived through the rise and victory of Trumpism; it can happen here, and it has. This isn’t just my opinion; it’s also the opinion of many of my colleagues at Slate and of journalists I know at other publications. For op-ed columnists and ideologically disinclined news reporters alike, Trump elicits a palpable disgust and a heretofore unknown variety of fear. This wasn’t initially obvious in the media’s coverage of Trump, however. Though many journalists recoiled from Trump, as an institution journalism failed to treat his rise with the seriousness it deserved. This is no longer an option. There was, however, a brief moment when something undeniably changed. The revulsion many of us felt privately began to be reflected in the coverage of the man and his campaign. As Margaret Sullivan, the Washington Post’s media columnist, told me, by the late summer “the mainstream media was more willing to say what everyone in newsrooms was saying, instead of being so careful and so cagy and speaking in journalese.” The television networks, belatedly, began to treat Trump less as a joke and ratings magnet and more as a threat to American norms and institutions (and a ratings magnet). Newspapers like the New York Times and the Washington Post used their news pages to expose his frightening behavior and beliefs, from his shady “charitable” endeavors to his authoritarian tendencies. 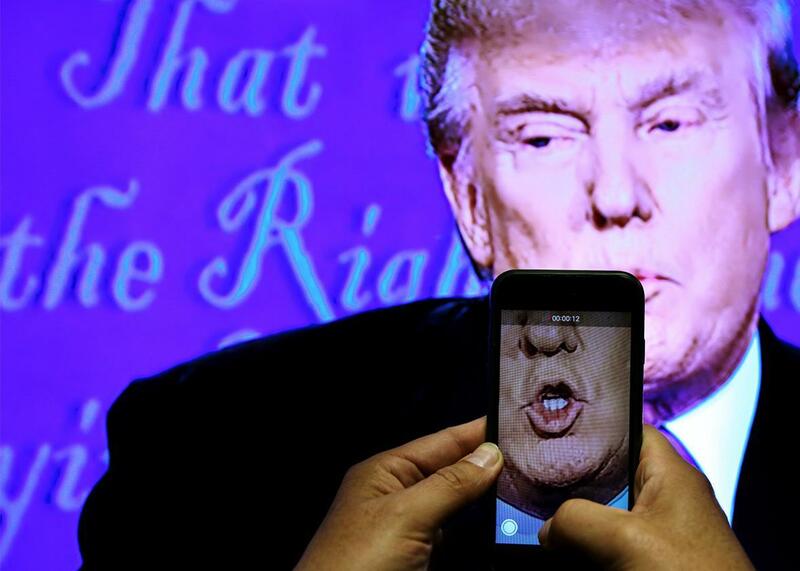 On social media, journalists displayed a contempt for Trump that would have been unimaginable to someone following politics before 2016. “I do think we saw a norm change in the mainstream print press in which they really got away from the old false equivalence idea and would say, ‘Major party presidential candidate said something that was not true, that was a lie,’ ” Nicholas Lemann, professor at the Columbia School of Journalism and staff writer at the New Yorker, told me. For the first time in a generation, there was a spirited debate about the ideal of “balanced” coverage. Perhaps it wasn’t the solution to covering a candidate who represented a peculiarly American strain of quasi-fascist white nationalism. The danger of Trump was and remains twofold: There is the man and there is the movement. There is the unstable narcissist who will head a federal government that possesses nuclear weapons (and the intelligence-gathering apparatus of the NSA), and there is the ugly ideology he espoused when he wasn’t busy contradicting it with his erratic pronouncements. This division between Trump and Trumpism raises two questions going forward for the press. The first is how to cover the man. He can no longer be laughed off as a buffoon, an idiot savant, or a sideshow act. The absurd personality, the ridiculous ego, the titanic self-regard: All of it matters. The personal really is political—and this personality now commands massive power. The media is of course multifaceted and hard to define. The reporters at the New York Times and Washington Post are members of the media; in 2016, thanks to CNN, so was Corey Lewandowski. Traditional print media handled Trump’s candidacy more ably than cable news, which relished the spectacle the candidate created and the ratings that came with covering it. But the first year of Trump’s candidacy was a disaster for the profession no matter how you define it. We treated Trump as the gloriously entertaining distraction and pop-culture figure that he admittedly once was. We occasionally stood up to defend democratic values from his encroachments, but we were unsurprisingly if indefensibly quicker to counter his attacks on freedom of the press than on other liberties. The second question is how the media deals with Trumpism, which is now the reigning ideology of the country’s dominant political party. The press has been no better on this score, covering the Republican Party of recent years as if it were a normal political party in a Western democracy. It isn’t and hasn’t been for a long time. But the media had become so accustomed to the ideals of balance and parity in coverage of the two American parties that it continued covering the GOP as if it hadn’t descended into quackery and madness. Trump’s takeover of the party thus came as a shock when it might well have been contextualized earlier on, if not predicted. Trump’s embrace of babbling nonsense on the subject of climate change, for example, is a direct outgrowth of the party’s long-standing disdain for intellectualism and for science. It is horrifically new for a modern major party nominee to express racism so openly, but virtually the entire GOP has been engaged in a dedicated effort to keep black people from voting for decades now. And when you spend years telling your voters that the media peddles nothing but lies and that the president is illegitimate, you are eventually going to be saddled with someone who simply raises the stakes: The media isn’t just dishonest; it’s part of a worldwide conspiracy. The president isn’t just illegitimate; he’s a Kenyan usurper. The GOP’s pre-Trump Trumpism allowed a dangerous demagogue to take command of the party, and now the country. Republicans may not have willed Trump, but they established the conditions for a man like him, in all his grotesque incompetence and know-nothingness, to be born. And Trump didn’t merely overwhelm the party; he was first appeased, then welcomed by opportunists and the weak-willed. He was ultimately supported by the vast majority of Republican politicians. In the wake of this bitter campaign, it might seem like common sense for the media to do its best to reach out to Republican voters—to earn their trust by showing respect for their voting preferences. CNN anchor Brian Stelter, who has been one of the network’s few bright spots this year, wrote in a column this week that the big question facing the media is how it can go about offering a hand to voters who feel their lives and concerns have gone uncovered by the mainstream outlets. But even if that were possible—something I have my doubts about—it’s not the solution. It may be true that too many reporters, cozy in their coastal cities, lost touch with the kinds of voters that fueled Trump’s rise. But many of those voters, while suffering legitimately, hold views that should not be countenanced in a liberal democracy and are not excused by economic hardship. Lemann agreed and thought the change was not merely the result of Trump. “It’s partly Trump, and partly that the media world is changing so rapidly. The establishment represents a smaller and smaller percent of the total media with a smaller and smaller percent of the audience. Within that tiny world, the percent of that world that is devoted to coming across as neutral is also shrinking. The New York Times in recent years is more Guardian-esque, at least as I read it.” It’s hard to imagine the Times surrendering its hallowed objectivity for a relationship with the Democratic Party akin to the Guardian’s relationship to Britain’s Labour Party, at least at the moment. Perhaps that will change. Arguably the strangest aspect of this election was how it made you feel as if everything was changing under your feet—and that nothing was changing at all. That was certainly true of the press: Every time you thought the press had turned a corner, it soon reverted to form. The GOP has become an extremist party without much of the media identifying it as such, and now it’s installed a volatile novice with disdain for our democracy in the White House. If we in the media return to pretending that we are not in the midst of a domestic and international crisis, we will be complicit in it.